When the weather gets warm, one thing that I always crave is BBQ. Sadly, I wasn’t brought up in a place where BBQ reigns supreme, so I don’t really know the difference between Texas, Carolina, Low Country, etc. All I know is that if it’s smoked and covered in sauce, bring it on. With my foray into weekday veganism, you might think that BBQ is a flavor that I’d not be able to integrate into a Tuesday evening. Guess again! If you’ve ever had seitan, you know that this faux meat product, made from wheat gluten and water, REALLY TASTES LIKE MEAT. Texturally, I wouldn’t take any bets on deciphering the difference between seitan and chicken. If you’ve ever had Whole Foods’ Vegan General Tso’s Chicken, you know what I’m talking about. With some pantry staples, and a few extras (like the vegan God-send — Liquid Smoke) I created my Bourbon BBQ “Pork” ‘n’ Beans. The measurements are a little bit off because, when it comes down to it, it’s up to your taste buds how much smoke you want, how much Worcestershire you want, etc. I also used sucanat, which is the most natural of all sugars (dehydrated, evaporated pressed cane juice). After some research, I knew that agave nectar was OFF THE TABLE. Apparently, it is as bad for you as high fructose corn syrup. And unless you have diabetes and need to pay attention to your glycemic index, I would suggest staying away. Just say no to chemicals! 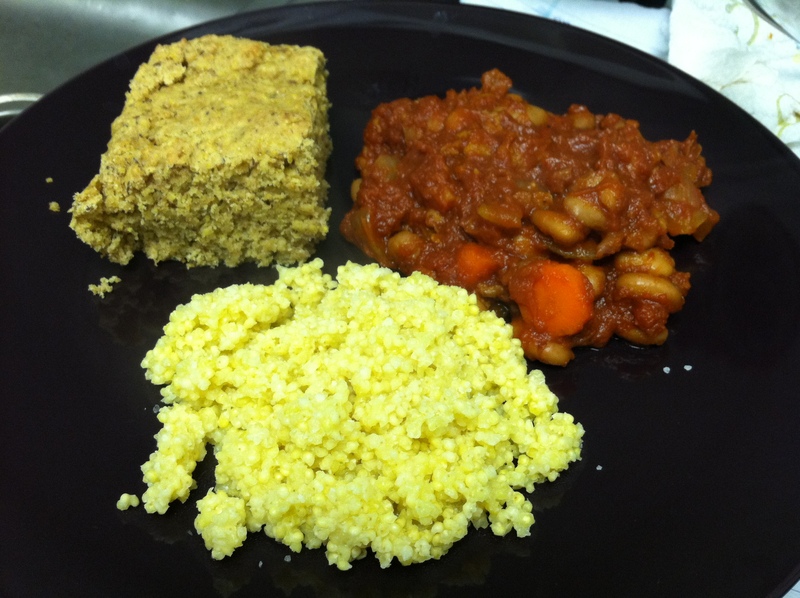 With an adventurous spirit, I decided to try millet (from my local organic market’s bulk section) to accompany my meal. Not a Smooth Move, Ferguson. The millet had a very strange taste. I think I will try it again, but cook in veggie broth instead of water. In a large saucepan, heat a couple of tbsp. of EVOO over medium heat. Add the onion and carrots and saute until translucent. Add the crushed tomatoes and tomato paste. Stir and simmer. Add in all of the remaining ingredients and bring to a boil. Reduce heat and simmer for 20-30 minutes. What better way to accompany my vegan BBQ than some warm cornbread. I found this recipe and made a few tweaks and it was INCREDIBLE. 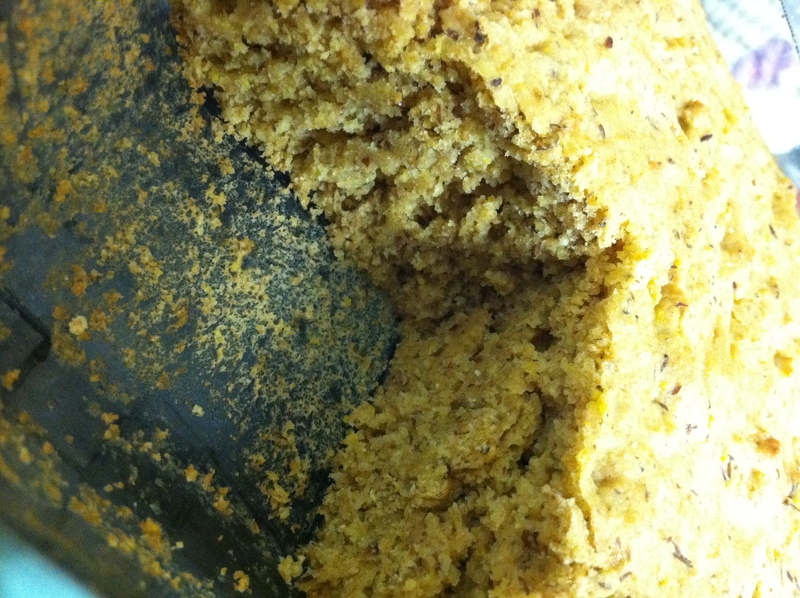 The ground flax seed takes the place of an egg, and I cannot WAIT to use that substitution in other recipes. In a large bowl mix together all of the remaining ingredients and add in the flax and water mixture. Pour into a lightly sprayed 9×9 baking dish. Bake in a preheated 425 degree oven for 20-25 minutes, or until a fork comes out clean. Hope you have fun with this meaty meal!